There was not much blue sky today mostly it’s been rainy and grey. As predicted the wind has whipped up and I can hear it howling and whirling around rustling the leaves as I write. 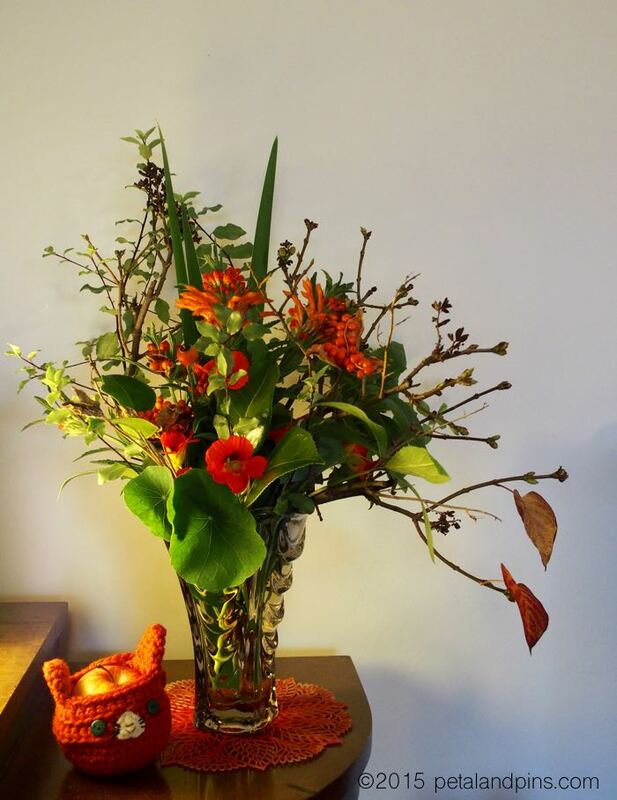 Yesterday I picked a vase of flowers and the splash of orange is perfect to add some brightness to inside as a counterpoint to the drab weather, especially as the forecast for the rest of the week is for more of the same. 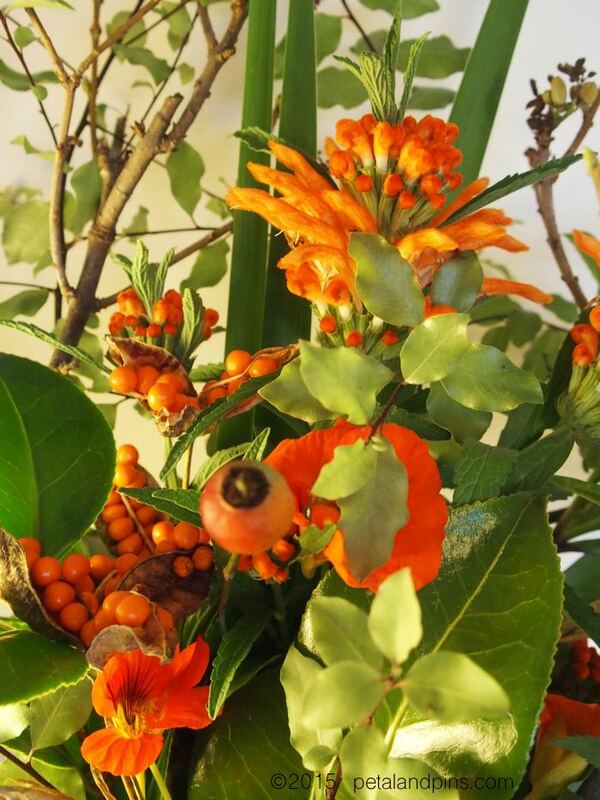 Not a lot of flowers about in my garden at the moment but lots of Autumn foliage and seed pods so I have used those in my arrangement with a few nasturtiums and minaret flowers. I popped the ‘apple cosy’ I bought on our road trip to the north west of Tasmania along side the vase (isn’t it cute!). Besides the colours complementing the flowers it’s a perfect symbol of mid autumn at my place since there are apples still on my tree and a cupboard full of just bottled apples ready for a winter of apple crumbles. I had never heard of, much less seen an apple cosy before – its purpose is to stop an apple getting bruised in a lunchbox. When I saw this little bit of knitted cuteness I immediately thought of my Fairy Dust friend who loves apples so I’ll be giving it to her next time we catch up. Have you ever seen an apple cosy? What’s your favourite winter apple dessert? 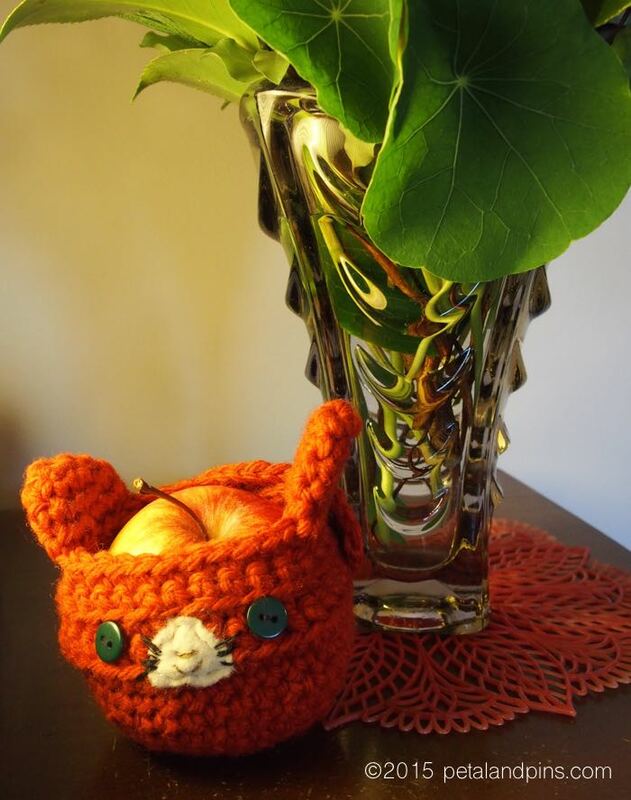 Beautiful arrangement and brilliant idea of an apple cozy. Needed that in my lunchbox as a kid. 🙂 My favorite apple dish is a crisp, mostly because it is quick and easy! Apple Crumble – just like my Mum makes – with a thick, hard crumble on the top. Lovely colours in the arrangement.